Effective Feb. 1, 2013, Darrin L. Williams, a lawyer and current member of the Arkansas General Assembly, will be chief executive officer of Southern Bancorp, Inc., a family of a community development bank (the fifth largest in the United States) and a nonprofit affiliate that work in concert to revitalize underserved communities in the mid-South. “Darrin’s financial skills, legal experience in securities and financial regulation and history of advocating for the rights of the disadvantaged in both his law practice and his political career make him the perfect choice to lead Southern Bancorp in its mission to build communities and change lives,” says Walter Smiley, current CEO and board chairman of Southern Bancorp, Inc.
Williams is a principal at the law firm of Carney Williams Bates Pulliam & Bowman PLLC, where his work focuses on protecting consumers. He attended Little Rock’s Central High School, Hendrix College in Conway, Vanderbilt University School of Law in Nashville, Tenn., and Georgetown University Law Center in Washington, D.C., where he received a master of law degree in securities and financial regulation. Williams worked in community outreach for the Democratic National Committee in Washington, D.C. during the presidency of Bill Clinton before returning to Arkansas as chief of staff and counsel to then state Attorney General Mark Pryor, now a U.S. Senator (D-Ark.). In this position, and later as Chief Deputy Attorney General, Williams took on individuals and businesses that targeted Arkansas’ seniors and children. He is actively involved in many professional, political and community associations including serving as a board member for Our House, Inc., CARTI and the State Legislative Leaders Foundation. 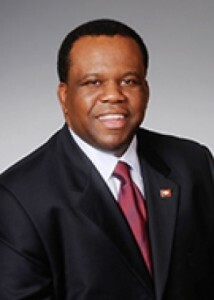 Williams has been a member of the Arkansas General Assembly since 2008 and was selected as the first black speaker-designate of the Arkansas House in March 2012 when Democrats controlled the lower chamber, a position he lost in November 2012 when Republicans gained control of the chamber for the first time since Reconstruction. Smiley will be actively involved in Williams’ transition, which will be ongoing through the 2013 Arkansas legislative session convening Jan. 14. Williams is expected to assume full-time responsibilities as CEO once the legislative session concludes and work part-time until then. “I look forward to joining the team at Southern and continuing to build upon its fine work of transforming communities through strategic investments in people and their dreams for a better tomorrow,” Williams says. “Adding Darrin to our senior management team positions the company to achieve great progress in the communities we are dedicated to serving. Darrin joins John Olaimey, who serves as president and CEO of Southern Bancorp Bank, and Tanya Wright, who serves as group president of Southern Bancorp, Inc. and CEO of nonprofit affiliate Southern Bancorp Community Partners,” says Smiley. Southern Bancorp is one of America’s largest community development banks. Southern seeks to reduce poverty by improving education and economic opportunities for individuals and families.